Photo(s) that made you go WOW! And no more parts needed, as the forum now allows for multiple pages so we can put together a great collection of awesome photos. I've also dropped the "recent" in the thread title, as people should also be encouraged to post incredible photos that they've only just discovered. The only thing I ask is that the photos that are posted are from the A.net DB. Re: Photo(s) that made you go WOW! Definitely deserves a place here. Night shots like these are very very intriguing and really made me go wow! I tried to do something similar a few days ago with ItAF Tornados making night training missions but I had no luck, as I completely wrong camera settings and I took very noisy shots. "Your task is not to foresee the future, but to enable it." I would love to know the settings the Emirates A380 was shot at!?!? You can try to E-mail the photographer (and post the answer here ). I contacted Keiichi Egawa the other day regarding his night photos. I'm a HUGE fan of those and they're good inspiration and motivation to go out and experiment myself. He was kind enough to send me 4 of his recent photos with the EXIF included. Seeing that info was very interesting to say the least. I can imagine for those kind of nightshots you need at least a f2.8 lens and a full frame camera right? I would think so yes. To give an idea; I work with a Canon 5DII and 85mm 1.8. Keiichi Egawa mentioned that he uses the Nikon D5 and 105mm 1.4. Respect. I didn`t even know the F-numbers went that low. Really great you share those photos with us on the site. I've always thought this one to be rather spectacular. The plane flew over a hockey field at night while the local hockey team were training, with the flood lights on. Enough light to make the plane fairly bright. The other photo above looks like it might have been done in a similar way. Look up the location of the photo on Google maps and see if there are any sporting fields or parks with bright lights around them. Hoping Szabo Gabor will chime in here. It's a great shot! I can remember a day at Sydney airport where the fog in the morning was so heavy that virtually everything was diverting elsewhere. Delta tried landing on RWY34L and gave up after two attempts IIRC, heading off to Brisbane instead. And the United crew on a B747-422 (remember those?) tried runway 34L and then gave up. 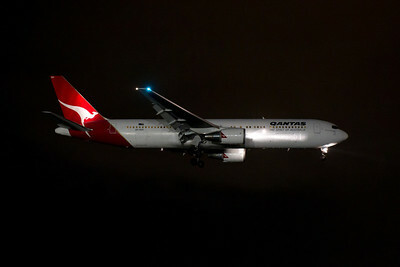 They then tried the other direction (runway 16R) and made the landing work, with virtually no visibility. We could hear them decelerating down the runway in front of us, but couldn't see them. Later on in the morning when the fog was burning away, virtually every plane had those fog effects and streaming vortices coming from the wing-tips. Except the fog over the wing was so dense that it completly obscured the fuselage of the plane, leaving just the front of the plane and the back, and the engines visible. Quite surreal. If you have a D4 and F/2.8 lens, you can do that. Of course it still takes skill to expose it properly, but at least you get the opportunity. I've done a few like that myself. I remember doing that with the D3S at 10,000ISO on an Emirates shot and one of the Russian photographers questioned immediately if it was a D3S. Having the F/2.8 lens makes it so much easier in combination with ISO6400 or ISO10,000. But again, you still need to know your camera and have the eye for the shot. That is better than all the helicopter spotting photos put together. Stunning location and lighting. Well done Keiichi Egawa - another in a line of stunning photos. That's how you use ambient light in the most stunning way. I can never seem to get a high ISO image cleaned up as nicely as you have on the Emirates as well as some of the other magnificent night images on this thread. Anyone willing to share their workflow? I use the noise reduction tool in Lightroom and if the photo is really grainy/noisy also Google Nik Dfine. But I still have to find the right balance between reducing noise and losing details. Thanks. I use the NR tool in PSE but have not tried Google Nik Dfine. WIll have to take a look. You do fine work, by the way! But you still have to do a lot of masking when applying the noise reduction with Topaz as it can make parts of the image look very washed out. On newer Nikon cameras like the one mentioned above and with those kinds of settings, you should be getting a fairly clean image right out of the camera that won't require too much special editing. Only when going up to ISO8000 or ISO10000 does it get difficult. And also make sure you get the exposure absolutely spot on first go, you don't get much scope to brighten those night time shots in post-processing without showing up a lot of noise. Otherwise, if you can handle a slower shutter speed (and if the kind of shot allows it), do that - it'll let you use less ISO. I had F/2.8, 200mm (with a crop down to 5050x3367 from 7360x4912), ISO6400, 1/13sec and absolutely no ambient light of any sort. The plane was also poorly lit. I used the standard Camera Raw 6.7 noise reduction to get it to that level, but no special noise reduction (or sharpening) methods which you'd use if it was to be for here. I wasn't totally happy with that photo, but it was a pretty hard one to get anyway so I can't really complain. 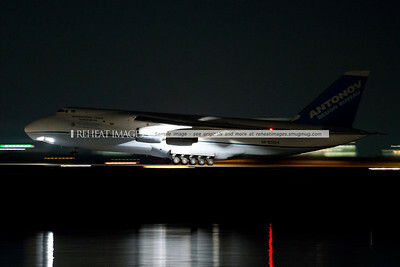 AN-124s are rare around here, and to the naked eye, you could barely see a dark shape thundering along the runway. Another way is to use the multiple layers with blur filters and do masking of the noise reduction layer and then use blending modes to cut out the particular types of noise you don't want in the image. I think all WOWair photos can get you Wow, right ?! The photo of this Aeroflot 777 made me go OMG! I had to do a double take - because not only is it a photo of a location that's not often represented on Airliners.net but I happened to be stood not far from the photographer (whom I don't know and have never met), taking a video of the very same aircraft landing. I uploaded the video to my channel whilst in Thailand https://www.youtube.com/watch?v=l51JfYAQm_o where I spent the whole of my holiday on the beach by the runway. I had to double take when I saw this photo pop up on Facebook. It gave me an OMG and a WOW at the same time. Just try to use https://assignment.essayshark.com/algebra-help.html. Here you will get expert help and response. Always pure joy to come across such good photos when screening. Yes, the above is a great air to air photo. No helicopter spotting mission is going to get that. Totally agree with you - that's amazing. One of the most stunning shots I've seen in a while. Normally a motive rejection, but holy sh*t the quality Just had to accept it. Quality first. Fully agree! Today's equipment, when in capable hands can lead to spectacular results indeed. We are all glad you accepted it. Incredible details in that photo. I wonder how the original framing was before cropping. The above photo of the B2 really is stunning. Unusual angle of the photo and the clarity of it. Wow indeed. Very impressive one ! The fireworks seem very close to the airport ! I could easily fill this thread with Keiichi's night shot collection.